Natural Vetcare Ageility is a supplement which comes in the form of palatable easy to digest pellets and promotes health in dogs, particuarly senior dogs. Ageility provides glucosamine and chondroitin as nutritional promotion of normal joint function. It also contains a unique herbal support which helps encourage an active mind in the later years. By accurately combining vitamins and minerals, Ageility supplies your dog's old age general health requirements along with additional nutrients which promotes health in a plethora of areas. Hydrolysed Poultry Protein, Glucosamine, Methyl sulphonyl methane, Linseed oil, Ginseng (Siberian, 44g), Omicha berries (44g), Hawthorn berries (27g), Chlorella (dried), Chondroitin sulphate. dl-Methionine (3.1.1, 47000 mg), Manganoussulphate, monohydrate (E5, 650 mg, 201 mgManganese), Sodium molybdate, dihydrate(E7, 20 mg, 7.96 mg Molybdate), Zinc oxide(E6, 5920 mg, 4260 mg Zinc), l-Carnitine (75mg), Vitamin B1 (114 mg), Vitamin B6 (113 mg). Below are some recent questions we've received regarding Natural Vetcare Ageility for Dogs, including answers from our team. It is safe to give vitamins along with this product. You should follow the guidelines provided for the vitamin product you use and do not give excessive amounts as some vitamins are toxic in large doses. There should not be a conflict with Ageility though. Can both of the above be taken together and with daily Metacam? Both Senilife and Vetcare Ageility are safe and natural food supplements which can be given together and with prescription medication like Metacam. There is no problem in using them all at the same time. The Metacam itself is the product most likely to cause side effects, given on its own or with other things. However it is also very effective and as long as you give the correct dose and stop if there is any digestive upset, Metacam is one of the most useful medicines available for older animals. is it ok to take Ageility whilst on daily metacam? Vetcare Ageility is a safe and natural food supplement and is completely safe to be combined with other products including Metacam. i have a Labrador who is 12 years old and still fit and healthy but gets stiffness in her rear legs. how many of the pellets would i have to give her daily? and how many pellets per tub? If you buy the 300g size tub, then for a dog over 21kg in bodyweight, one tub should be a 30 day supply. Can I get Natural Vetcare Ageility in liquid form? 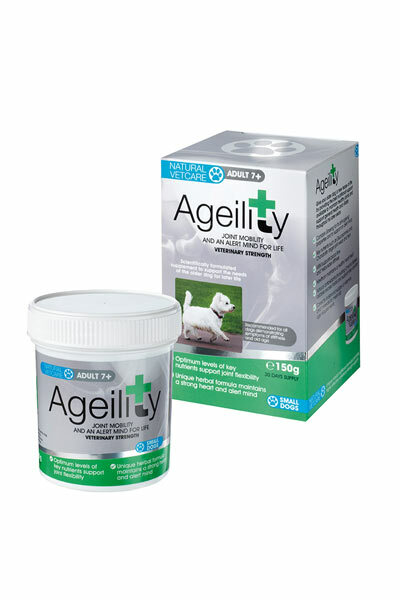 Ageility is only available in pellet form which can be easily mixed with the dog's meal.